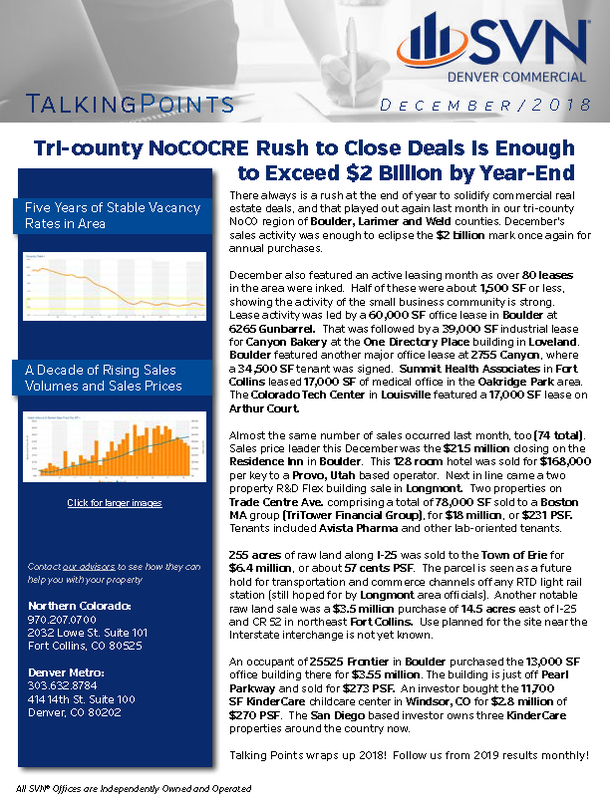 There always is a rush at the end of year to solidify commercial real estate deals, and that played out again last month in our tri-county NoCO region of Boulder, Larimer and Weld counties. December’s sales activity was enough to eclipse the $2 billion mark once again for annual purchases. December also featured an active leasing month as over 80 leases in the area were inked. Half of these were about 1,500 SF or less, showing the activity of the small business community is strong. Lease activity was led by a 60,000 SF office lease in Boulder at 6265 Gunbarrel. That was followed by a 39,000 SF industrial lease for Canyon Bakery at the One Directory Place building in Loveland. Boulder featured another major office lease at 2755 Canyon, where a 34,500 SF tenant was signed. Summit Health Associates in Fort Collins leased 17,000 SF of medical office in the Oakridge Park area. The Colorado Tech Center in Louisville featured a 17,000 SF lease on Arthur Court. Almost the same number of sales occurred last month, too (74 total). Sales price leader this December was the $21.5 million closing on the Residence Inn in Boulder. This 128 room hotel was sold for $168,000 per key to a Provo, Utah based operator. Next in line came a two property R&D Flex building sale in Longmont. Two properties on Trade Centre Ave. comprising a total of 78,000 SF sold to a Boston MA group (TriTower Financial Group), for $18 million, or $231 PSF. Tenants included Avista Pharma and other lab-oriented tenants. 255 acres of raw land along I-25 was sold to the Town of Erie for $6.4 million, or about 57 cents PSF. The parcel is seen as a future hold for transportation and commerce channels off any RTD light rail station (still hoped for by Longmont area officials). Another notable raw land sale was a $3.5 million purchase of 14.5 acres east of I-25 and CR 52 in northeast Fort Collins. Use planned for the site near the Interstate interchange is not yet known. An occupant of 25525 Frontier in Boulder purchased the 13,000 SF office building there for $3.55 million. The building is just off Pearl Parkway and sold for $273 PSF. An investor bought the 11,700 SF KinderCare childcare center in Windsor, CO for $2.8 million of $270 PSF. The San Diego based investor owns three KinderCare properties around the country now. Talking Points wraps up 2018! Follow us from 2019 results monthly!